He is an expert with the latest technology...a madman with the mind of a genius and the heart of a killer. He quietly stalks his prey. Then he haunts the police with cryptic riddles about the crimes he is about to commit--always solved moments too late to save his victims' lives.Police lieutenant Eve Dallas found the first victim butchered in his own home. The second lost his life in a vacant luxury apartment. The two men had little in common. Both suffered unspeakable torture before their deaths. And both had ties to an ugly secret of ten years past--a secret shared by none other than Eve's new husband, Roarke. Lieutenant Eve Dallas has another serious case that ties into her husband Roarke’s past. Presently, she is working hard to solve murders that are apparently connected. One thing that Eve found that the victims had in common is that they were brutally tortured before their murders. There is another unlikely connection to the murders and Roarke’s past. This involves Summerset, the man that works for Roarke, and who happens to be the bane of Eve’s existence. Eve and Roarke, as always, are incredible together. Eve had gone through a horrid childhood and, although she truly loves Roarke, she seemed to hold herself back from him in earlier books. By now, however, her love for Roarke is complete, and that is very rewarding. Nonetheless there is a strain as Summerset’s past comes front and center. This thrilling book had plenty of intrigue, but also delivered emotion and passion. It was finely balanced and was a wonderful addition to the series. The next book is Holiday in Death. 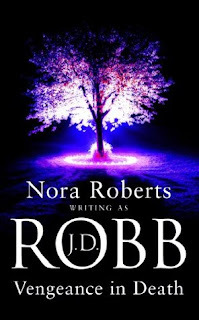 Gasp, I just realized, I've never read Nora Roberts - how can that BE? I'd not heard of this book until now. Looks good. Great review. Yay for Nora Roberts!!! She is the one that got me stuck on romance in the first place. I haven't read any of her J.D. Robb books yet but definitely intrigued :) I love the Cordina's Royal Family series. So romantic.